No, not the sweater. Carmelo’s still got about 6 inches of sleeve left to go. I finished up the handspun I showed you the other day! Details – Cloverleaf Farms Merino in “Rose Quartz”, 2 4oz. 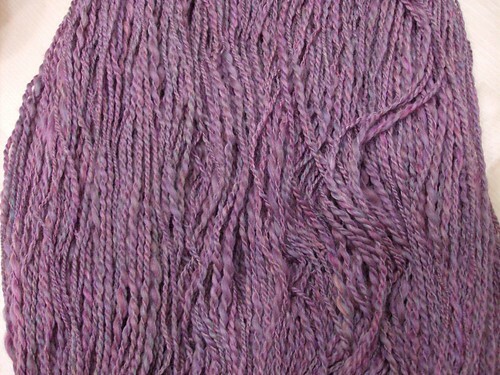 braids, resulting in 262 yards, 223g/7.875oz. at about 13WPI. I only lost 1/8 oz! A record for me! 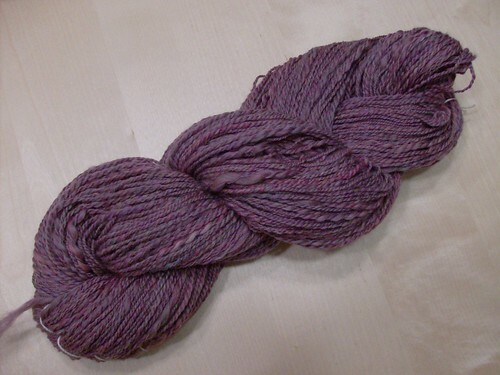 This is the first official handspun from poor neglected Zaphod, and I’m really happy with it. I did have to use Elphaba to ply it, because I wanted to use the jumbo flyer, which I don’t have for Zaphod yet (although Dave does make them now…). November 26th, 2008 | Tags: Spinning | Category: Misc. 7 comments to It’s Done! If it was too perfect it wouldn’t be handspunny enough! I love it! I love the fatty-bobbins my wheel came with. I don’t know how peeps live w/out them! They are not “uneven spots” – it’s called “feature”. And it’s all te difference between industrial yarn and handspun. Why spin yourself if you need shelflike yarn? It’s geourgeous! I love how you managed to keep it “fluffy”! Very purdy. I can’t wait to see what wonderful thing you knit it up to be. The uneven spots are cool – call them “addins” or “extras” or “character” or “flair” or “purposely places nubbies” or something equally silly. ooo… pretty. Looks like you could just wrap it ’round your neck as is and be perfectly happy with it that way.